To evaluate the effects of spray irrigation on subsurface aquifers and potential overland flow. Brownfield Science and Technology, Inc. (BSTI) was recruited to resolve a dispute regarding the influence from a spray irrigation field to surface and subsurface conditions. 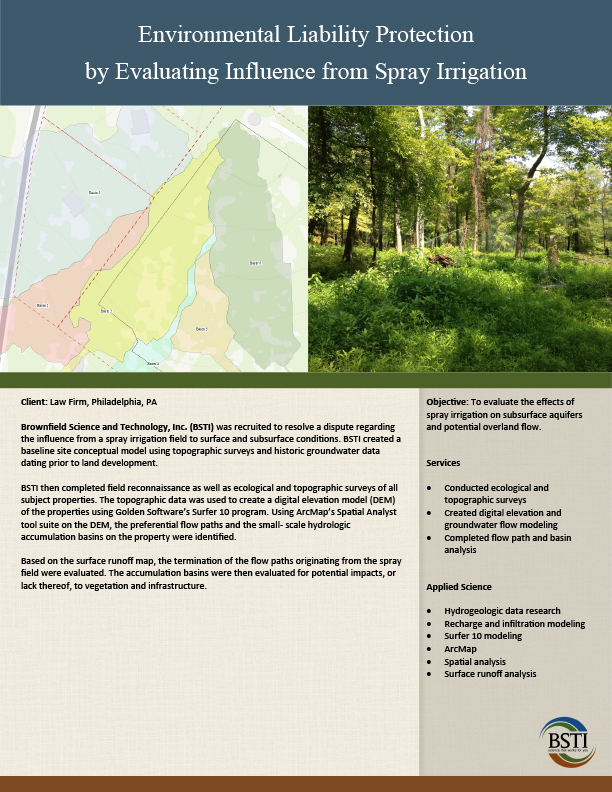 BSTI created a baseline site conceptual model using topographic surveys and historic groundwater data dating prior to land development. BSTI then completed field reconnaissance as well as ecological and topographic surveys of all subject properties. The topographic data was used to create a digital elevation model (DEM) of the properties using Golden Software’s Surfer 10 program. Using ArcMap’s Spatial Analyst tool suite on the DEM, the preferential flow paths and the small- scale hydrologic accumulation basins on the property were identified. Based on the surface runoff map, the termination of the flow paths originating from the spray field were evaluated. The accumulation basins were then evaluated for potential impacts, or lack thereof, to vegetation and infrastructure.